The Galerie bath collection offers a choice of bath styles in a wide range of sizes, so there is a solution for almost any bathroom. 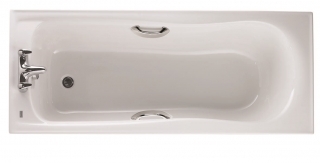 Included in the Galerie range are standard rectangular baths and offset shower baths. 0 tap hole Galerie bath models are complemented perfectly by a set of wall-mounted taps, or by one of our contemporary bath spouts. Accessorise the 2 tap hole Galerie baths with a pair of bath pillar taps, or deck mounted bath filler tap. The Galerie range offers dedicated bath panels for rectangular and shower baths. Also in the range is a Galerie bath shower screen for use with shower bath models. Ideal if you're working to a budget, the Galerie collection also offers a 25 year manufacturers warranty.